Earlier this year, Time Out headquarters in London asked the editors of all local editions to prepare an "ultra-useful" mini-guide to their city -- its art, nightlife, restaurants, and sights, along with hot tips and fascinating bits of trivia -- that could be used by any of the company's 60 offshoots around the world. The project editor praised my guide to Istanbul as "fantastic. A gorgeous piece of writing – far and away the best one I've had back so far!" 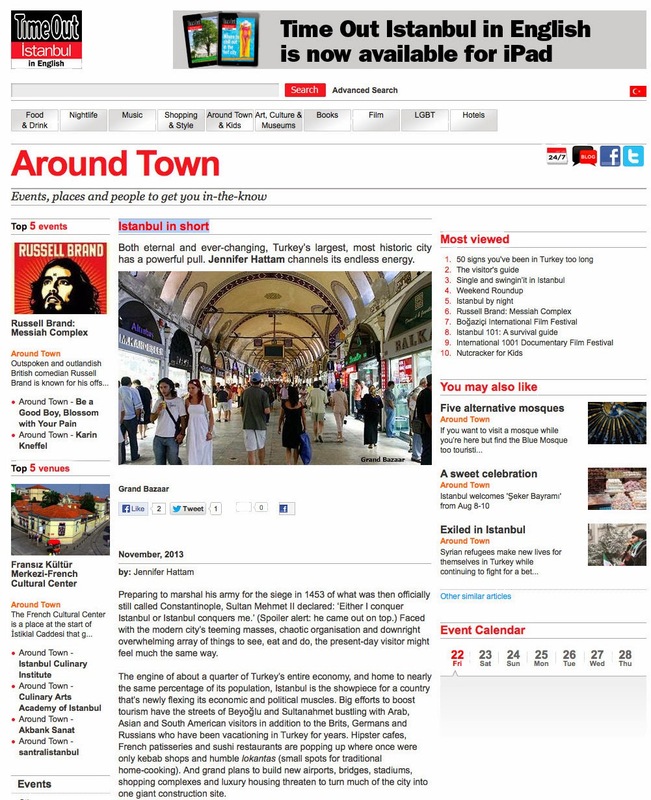 Following my departure from the magazine, Time Out Istanbul published the piece this month as "Istanbul in short." Have a read and discover what has made Istanbul, despite its many faults, a conqueror of visitors' hearts for hundreds of years and counting. UPDATE:Time Out Dubai published a shorter version of my city-guide in December under the title "Why you must go to Istanbul."